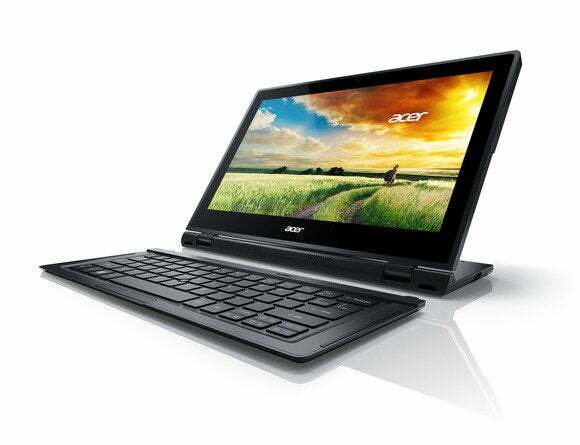 The Aspire Switch 12 has a 12.5-inch display with a 1920-by-1080-pixel screen covered with Corning’s Gorilla Glass. It has a low-noise, fanless design and uses Intel’s low power consumption Core M processor, a chip designed to bring PC performance to thin tablets. The Acer Aspire Switch 12's various usage modes. Acer’s product is similar to a PC convertible made by Toshiba, which the Japanese company claimed could switch into seven different modes. The Taiwanese PC maker isn’t saying when its device will launch in the U.S., but it will arrive in Europe, the Middle East, Africa and Asia by year-end, starting at 649 Euros ($810).